Having entered Scapa Flow, the sight was not what the men on U-47's conning tower expected. The sea looked empty, no lights were to be seen, and there was an eerie silence. A patrol boat was soon sighted and Endrass was convinced they would be spotted, but again no response came. The patrol boat just sat there, motionless in the silence. It seemed to be that the last thing the British expected to see was a German U-boat. Continuing westwards on a heading of 251 degrees, the crew of U-47 failed to spot four British cruisers stationed in the western sector - the heavy cruiser Belfast and the light cruisers Caledon, Columbo and Delhi. Deciding to turn back on themselves, a course of 70 was set which took the boat back in towards Mainland and the entry point at Kirk Sound. Still nothing. Prien then gave to order to swing to port, new course 50 degrees. By now the U-boat had been circling for more than half an hour at which Prien decided to change direction completely. The decision was made to set a new course of 340, towards the north-eastern sector of the bay. The dearth of vessels present in the Flow did not reflect what Prien had seen in the latest intelligence reports he had received; by sheer coincidence, much of the Home Fleet had departed the previous night for the Norwegian coast, among them the battle cruisers Hood and Repulse, the battleships Nelson and Rodney and the aircraft carrier Furious. One can only wonder what the impact might have been had these ships waited a couple of days or if U-47 had made its way into the base just two days earlier. Having scanned the waters for what seemed like an age, some of the crew of U-47 were becoming agitated - this was a far cry from the shooting party they had expected. As the boat inched slowly along the Mainland coast, Prien and his colleagues on the bridge trained their binoculars on the shore. Still they could see nothing, and doubts as to whether the mission was worth the risk began to creep into their minds. Suddenly one of the men on the bridge, Petty Officer Ernst Dziallas, nudged Endrass. A ship lay ahead, 10 degrees to starboard. Endrass confirmed the sighting, and Prien grabbed his binoculars. The distance was calculated at around 4,000 metres, and the vessel was immediately identified as being of the Royal Sovereign class. No sooner had the first ship been spotted when another was sighted immediately behind. 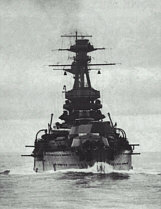 After studying the silhouette, this second vessel had been identified as a battlecruiser, either the Repulse or the Renown. Prien informed his colleagues that the Renown was known to be away on operations, and so - according to a crewman who claimed to be standing with him at the time - concluded the ship could only have been the Repulse. This was of course an error and Prien himself was probably not wholly certain about this identification: no actual reference was made to the name or type of this vessel in U-47's log, or Kriegstagebuch. The second ship was later confirmed to be the old aircraft carrier Pegasus, and was to become the subject of a long-running saga in the story of the Scapa attack on account of its silhouette not looking anything like that of a major battleship - lending credence to the theory that Prien could not have been much of a submarine commander if he could make such an elementary recognition mistake. Moreover the Repulse, as has already been mentioned, had departed the previous night - although reconnaissance photographs taken by the Luftwaffe on 12 October had shown the Repulse to have been in the vicinity. It is highly likely that the crew of U-47 were using these photographs as basis for their reconnoitre, and mistakenly concluded that the dark shadow north of the Royal Oak was indeed a second battlecruiser. The men in U-47's torpedo room, who not long before had been almost convinced they were not going to see any action, quickly adopted battle stations. At 0058 hours, Prien gave the command to launch all four torpedoes from the bow tubes, two at the northern 'fat fellow' and two at the southern. Only three of the four torpedoes were released however, as there appeared to be a problem with the firing mechanism on tube four. Von Varendorff set his stopwatch, and the men of the bridge waited with nervous anticipation. After an agonising wait of around three and a half minutes, just a single explosion was heard. Assuming that the northern vessel had been struck, Prien gave the command to turn U-47 around and fire the stern torpedo, but like two of the first three, it too was unsuccessful. Unbeknownst to Prien the first torpedo had in fact struck the southerly battleship, the HMS Royal Oak, at 0104 (0105 according to other sources); later reports indicated that the crew had been clearly shaken but not overly disturbed - in spite of the fact that this first torpedo had blown a hole some forty to fifty feet wide and three plates deep in its starboard bow. It was probably assumed by the crew of the British ship, still clearly under the false illusion that they were immune to enemy submarine-based attack, that the sudden shudder had been caused by an internal explosion - with cause being apportioned to the on board carbon dioxide tanks. Not thinking anything more of it, many of the Royal Oak's crew had simply returned to their bunks. The path taken by U-47 during its attack run on the Royal Oak. Having managed to fire its first salvo of torpedoes undetected, the U-boat was able to turn and reposition itself for a second and fatal attack. The torpedo trails on this map illustrate what was reported in U-47's log - a single strike on the northern ship (later reported as the Repulse) and two on the southernmost vessel, the Royal Oak. Click here to download a zip file containing a large-scale scan of Prien's original logbook map. Having waited a short while for the reaction that never came, Prien decided to give it another shot, and ordered the crew to reload the tubes. By this time the problems with tube four had been rectified. With tubes one, two and four at the ready, U-47 worked itself back onto a course of 310 and back into firing position. The distance to the target was now less than 1,500 metres; Prien could only hope that the return on this salvo would be better than the last. All three torpedoes were fixed on the southerly target, the large battleship Royal Oak. The command to fire rang out, and von Varendorff once again set off his stopwatch. After around three minutes (0116 hours), there were two resounding explosions as the hull of the British vessel was torn apart, belching plumes of thick black smoke. The sheer power of these explosions was felt by the men of U-47 standing on the bridge more than a mile away. NB. Most sources agree that there were not two but three hits: one exploded then two almost simultaneously. Contrary to Prien's belief that one of the first three torpedoes had struck the northernmost vessel, it had indeed hit the starboard bow of the Royal Oak. Two further torpedoes then hit the battleship amidships. A further five minutes later (approximately 0121) John Gatt, skipper of the mail boat Daisy II (which played more than a significant part in the rescue of the Oak's survivors), noted a flash to the masthead height and more black smoke - caused by an explosion in a small arms magazine that ignited cordite charges. Very quickly the battleship started to list heavily. 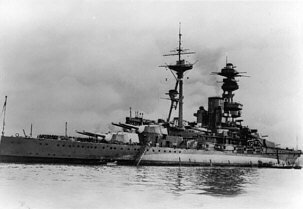 Not more than a quarter of an hour later the battleship had sunk to the bottom, taking with it the lives of 833 sailors, among them Rear Admiral Henry Evelyn "Evie" Blagrove, the commander of the 2nd Battle Squadron. The searchlights were all switched on, but given the fact that no-one had even considered the thought of a submarine attack, all of the beams were trained on the empty skies in a forlorn hunt for German aircraft. It was probably this collective thought on the part of the defenders that was to provide U-47 with the perfect opportunity to make a quick getaway. Amid the chaos it had caused, U-47 was now faced with the task of slipping out of the Flow back through the Kirk Sound. Due to the ebbing of the tide, exiting through the north channel route though which U-47 had entered the Flow was no longer a viable option; as a result Obersteuermann Spahr had no choice but to thread the boat through the southern channel, between the blockship Minich and the craggy coast of the islet of Lamb Holm. The task would have been difficult enough even in perfect weather and conditions, but here it was left to Spahr to guide the U-boat out in one piece through a narrow, shallow channel while both avoiding the enemy and taking on a current running in excess of ten knots. While the U-boat was desperately trying to execute its escape, the crew on the bridge had their eyes trained on what was assumed to be an enemy destroyer heading towards them. With the boat struggling to maintain momentum against the buffeting current, it appeared to the crew that the game was up. The British vessel apparently signalled in Morse, demanding identification; Prien gave the order to ignore. This led to yet more flashes of light from the British vessel, which was getting closer by the minute. When all had thought the inevitable had come, the British ship suddenly switched course. Much was made of this incident in Prien's 'autobiography', Mein Weg nach Scapa Flow; although the exit from Scapa was undoubtedly perilous, there is ample evidence to suggest that the 'destroyer' was little more than a boom vessel or fishing boat, and that things were perhaps not as dramatic as the German public were told soon after the raid. Furthermore, the first destroyer to move following the attack - HMS Mashona - slipped from No. 8 buoy at 0303 - almost an hour after U-47 had successfully exited the flow and marked its course for the return journey to Germany. There are a number of explanations one can offer: either Prien wanted to provide his superiors with a tangible reason for exiting the British base with five serviceable torpedoes remaining (although many would have accepted that getting out in one piece after sinking an enemy capital ship was success enough), or more likely the embellishments were the product of the Nazi propaganda ministry, for whom U-47's encounter with a fishing boat was nowhere near as exciting as coming face to face with and escapting from an enemy attack vessel. "Things are again difficult. Course, 058, slow - 10 knots. I make no progress. At high speed I pass the southern blockship with nothing to spare. The helmsman does magnificently. High speed ahead both, finally 3/4 speed and full ahead all out". With the boat safely out on the open sea and without an enemy vessel in sight, Prien saluted his brave crew and ordered them to stand down from battle stations. They had penetrated the impenetrable, had sunk a major battleship, and had hit another. Even he couldn't truly believe they had got away with it. Prien then shouted an order that no-one in their right mind could have refused: a shot of rum for everyone. It was in no way a cure for the seriously jangled nerves, but it certainly brought welcome succour to the many whose throats had gone completely dry during what had been a psychologically draining three hours. Mission accomplished, they were on their way home. Two images of the imposing battleship HMS Royal Oak, sunk by U-47 during the daring night-time raid at Scapa Flow. Contrary to reports put out by the BBC suggesting that the offending U-boat had been sunk, by 0215 Prien's boat was safely out in the open waters of the North Sea on its way to base at Wilhelmshaven. Some of of those who had been aboard the Royal Oak had been convinced that a submarine could never have made its way into the base and that the cause of the explosions had been internal; at this early stage the Admiralty chose not to commit themselves to offering any sort of conclusion. It was not until 0746 that the British realised what had actually happened, after divers had been sent down to examine the wreck where they found the remnants of a type G7e/2874 electrical torpedo. Many continued to doubt the veracity of Prien's version of events long after the event on account of the versions of the story that came from Germany - though it was later discovered that Prien himself had never subscribed to many of the claims that were later attributed to him, both in alleged 'speeches' engineered by the Nazi propaganda ministry and in what was ostensibly his autobiography, Mein Weg nach Scapa Flow.